Ideas for Mothers Day – gifts for every kind of Mum! FLAVR, the new fashion brand from global mobile accessories and connected devices specialist, STRAX GmbH, today launches a brand new range of phones cases for iPhone 5/5SE, 6/6S, 7, and Galaxy S7 and S7 Edge. The Real Flower collection includes real, pressed flowers in each transparent case so that every case made is individual. The cases are not only colourful and pretty but also have a great texture. The new cases will be available for £12.99 from Carphone Warehouse. The Pop collection from FLAVR is in line with the latest trends from the catwalk – florals, tropical motifs and tattoo-style motifs. The transparent case still shows the Apple logo but also adds a bright design and personal touch to a phone. The Pop collection will also be available from Carphone Warehouse for £12.99. Revel Lux is the new range by X-Doria featuring glitter, colour and metallic for iPhone 7. It combines both protection and an on-trend look for your phone. Available in various styles and colours as well as those shown in the images. Available for £19.99 on Amazon. The Piccadilly case is the perfect choice if you desire protection but want your phone to remain as close to the original look as possible. Offering the world’s first Metallic D3O® technology to perfectly colour match your iPhone, GEAR4 designers have perfectly tuned the colour match to appear as an extension of your phone whilst offering the best protection possible. GEAR4 is the first case brand to use INJECTABLE D3O®, delivering more impact protection per cubic millimetre than other leading materials. These ultra-slim, ultra-modern, ultra-protective cases can make an impact and still blend with contemporary life. Piccadilly is scratch-protected with UV coating and offers easy access to all ports. Available in Gold, Rose Gold, Silver and Black for iPhone 7 and iPhone 7 Plus. Check out Amazon from options. Berlin has a unique construction with soft silicon earbuds and a flat cable which gives you an ergonomic and tangle free fit. The earphones offer a playtime of up to 4 hours and the hands-free with microphone allows you to take phone calls without picking up your phone. Whether you run between meetings, relax in an aeroplane or commute on a crowded bus, Berlin is your everyday companion. Easy to bring, easy to use and easy to enjoy! Berlin are available from www.urbanista.com for £39.00. Sengled Pulse – For the aspiring Masterchef Mum – Listen to music in the kitchen without taking up worktop space! The Sengled Everbright combines an energy-efficient LED lamp with an integrated emergency light. In the event of a power outage or defective fuses, the new LED provides up to three and a half hours of light. This is possible thanks to the integrated rechargeable battery which is constantly charged during regular use. It lights when others fail. The Sengled Everbright comes up trumps when conventional bulbs stop working and only a search for a torch, candles or a lighter can light up the dark. Equipped with an integrated rechargeable battery (capacity: 900 mAh), the innovative bulb will provide light for up to three and a half hours when the power supply has been cut. The Sengled Everbright can help to find the problematic fuse box, serve as a back-up on construction sites or guide you out into a safe open space in an emergency. The Sengled Everbright is based on a very simple principle: The rechargeable battery is integrated into the housing of the LED light and is charged via a conventional E27 socket. With a regular power supply, the bulb provides light with a brightness of 500 lumens. In the event of a power outage, the Sengled Everbright automatically reduces its brightness to 300 lumens. This enables the lamp to save precious energy and delivers more than three hours of self-sufficient lighting. The Sengled Everbright is incredibly easy to install and use: The LED is inserted into a standard socket just like a normal light bulb and can be used to replace obsolete light bulbs. The smart bulb can now be operated as usual via the light switch with no need to control it via an app. The LED can also independently distinguish between the power being turned off via the light switch and an actual power outage. In addition to the extra security and comfort it offers, the Sengled Everbright also enhances users’ energy footprint: It has a lifespan of around 25,000 hours and when compared to a 40-watt light bulb of similar brightness, it consumes just 9 watts of power. Smanos UFO Panoramic Wi-Fi HD Camera is available separately or as an add-on to existing smanos home security systems, the new UFO Panoramic WiFi HD Camera utilises surveillance-grade fisheye lens technology, superior night vision and accurate motion detection to bring clarity, immersive vision and ease of use to home monitoring. By using an iPhone or Android smartphone, homeowners can zoom in and out digitally and view the scene anywhere, anytime. The footage is stored on-site (via an optional microSD® memory card), and can be accessed, shared and archived remotely via the cloud. Fee-based cloud storage options will be available shortly after the launch. Showcasing its commitment to brilliant colour, fantastic resolution and innovative technology, MMD, the leading technology company and brand license partner for Philips Monitors, offers visitors to ISE 2017 a one-stop encounter with display innovations that make working lives easier and more productive. ISE (Integrated Systems Europe), the largest AV systems integration show in the world, takes place from 7-10 February 2017 at Amsterdam RAI. MMD exhibits at the Philips stand 10-K136. Minimalistic looks for clear thinkers: on show is a new 24-inch display in the Moda design. Not only is the 245C7QJSB display the slimmest-ever from Philips Monitors, it is also frameless on three sides to create a truly seamless look, minimising distraction and maximising concentration. With Ultra Wide Color technology, users enjoy a wider range of colours for brilliant visuals. Philips Monitors innovations such as Flicker-Free (regulating brightness for a steadier picture), SmartContrast and SmartImage (which auto-adjust settings to the content being displayed) all work together to make desk hours more productive. Precise reproduction with Ultra Wide Color and UltraClear: the expansive 31.5-inch 328P6VJEB display gives users plenty of room to spread out and enjoy vivid, detailed reproduction in Ultra High Definition. The display combines UltraClear 4K resolution with the extra-wide colour gamut of the Ultra Wide Color technology and advanced Vertical Alignment (VA) for super-high contrast. With versatile MultiView connectivity and SmartConnect for 4K to stream high-res uncompressed video and audio, it is also designed to easily connect up to four sources simultaneously. Largest 4K curved monitor on the market: visitors looking to escape the bustle of the show for a few moments should check out the 40-inch BDM4037UW Brilliance Curved display. It wraps gently around the user’s line of vision to create more personal space, enabling people to immerse themselves in what’s on the screen, rather than being distracted by surroundings (such as a busy office). To bring graphics and images to life, the display features a CrystalClear 4K UHD resolution (3840 x 2160) and wide viewing angles. Integrated speakers complement the visuals with superb sound. Display with popup webcam: a great way to improve in-office security, the 27-inch 272B7QPTKEB Quad HD display makes life tough for camera hackers. It features a webcam that pops up when needed, and is otherwise hidden in the display frame – blocking off a potential spyhole for intrusion. 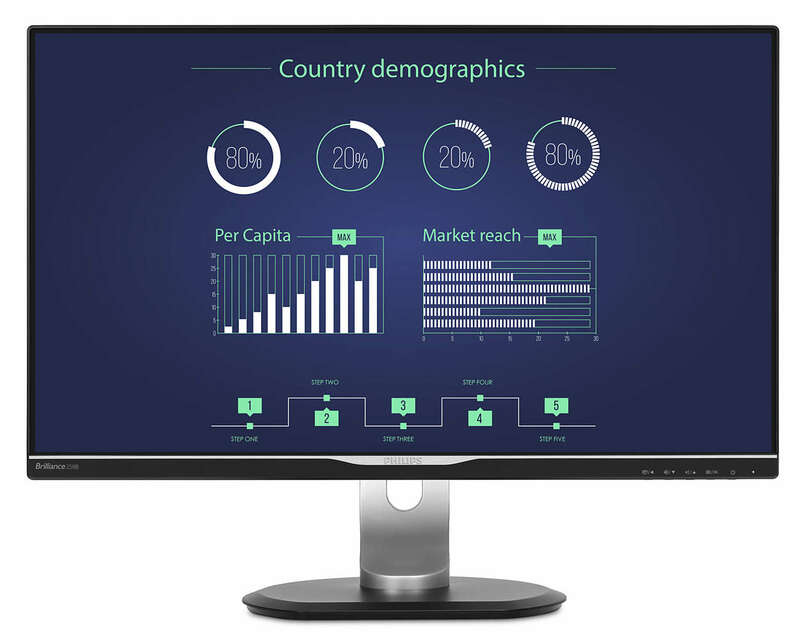 To minimise power consumption (up to 80% savings are possible), the display has Philips PowerSensor technology, which senses whether anyone is present at the desk, and automatically reduces screen brightness if the user steps away. 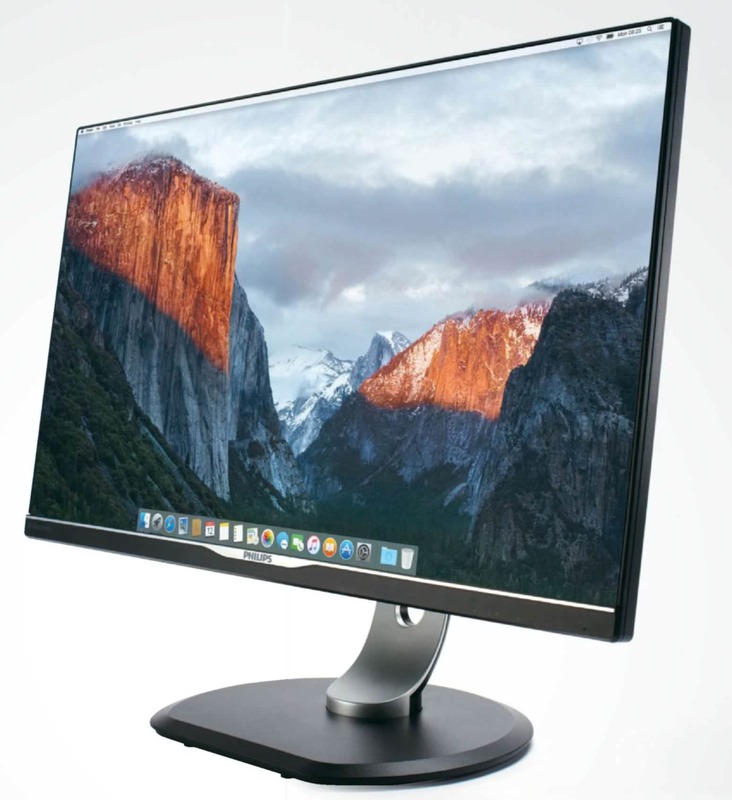 One-cable connectivity: for professional-grade connectivity, MMD showcases the 25-inch 258B6QUEB display with the latest generation USB Type C docking functionality. The easy one-cable connectivity of this display enables users to use their monitor as a docking station for any USB Type C-enabled laptop. With one single cable, the monitor receives video and audio input, and simultaneously charges the connected laptop. All peripherals can be connected to the monitor and used by the laptop, courtesy of the same USB Type C cable connection.